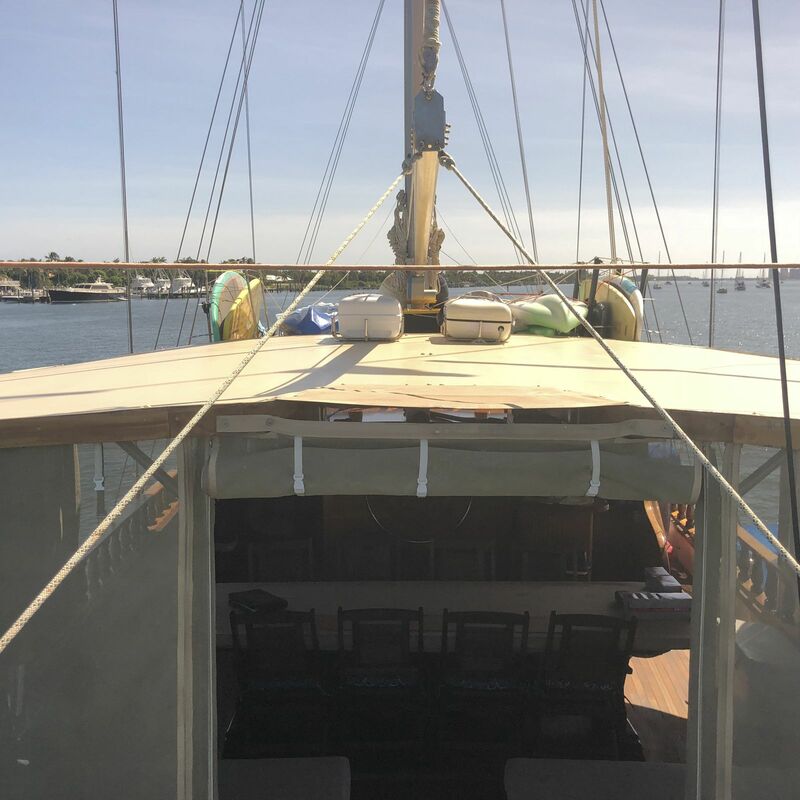 The “Barcelona Explorer” is one-of-a-kind luxury sailing schooner, based in the Abacos, Bahamas. 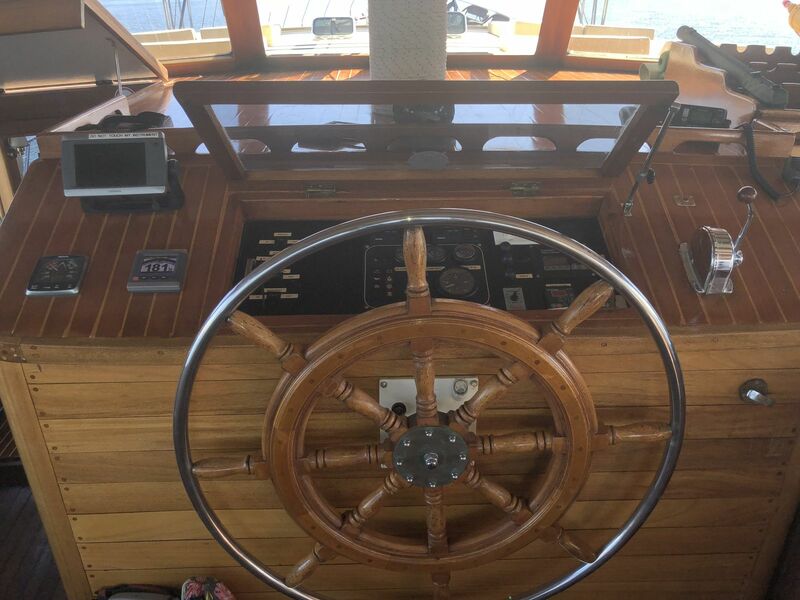 She is a work of art, and a testament to the finest in mahogany hull and teak deck craftsmanship. At a length of 100 ft. and a beam of 26 ft, she is as beautiful as she is stable in the water. 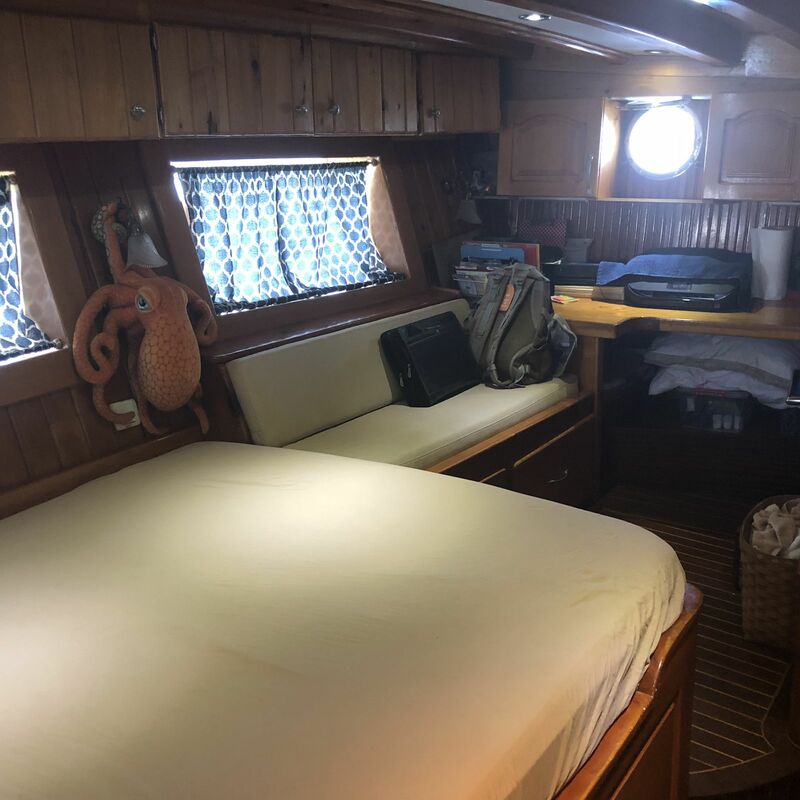 The motor sailor schooner has six queen-size guest staterooms with en suite bathrooms and showers, a gourmet galley and a luxurious salon. 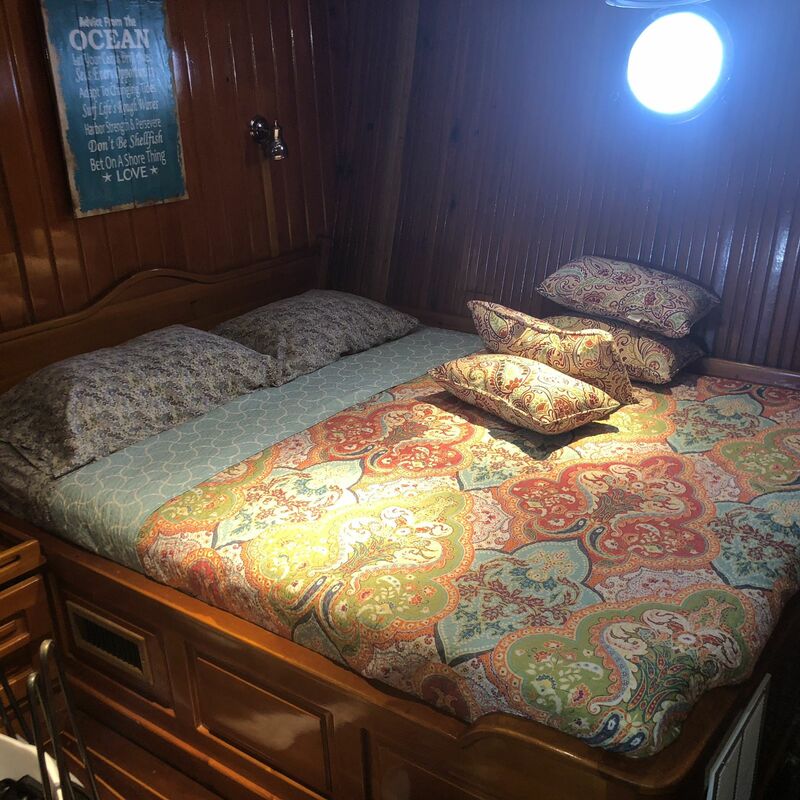 Accommodating up to 12 guests in large spacious staterooms in style and comfort. 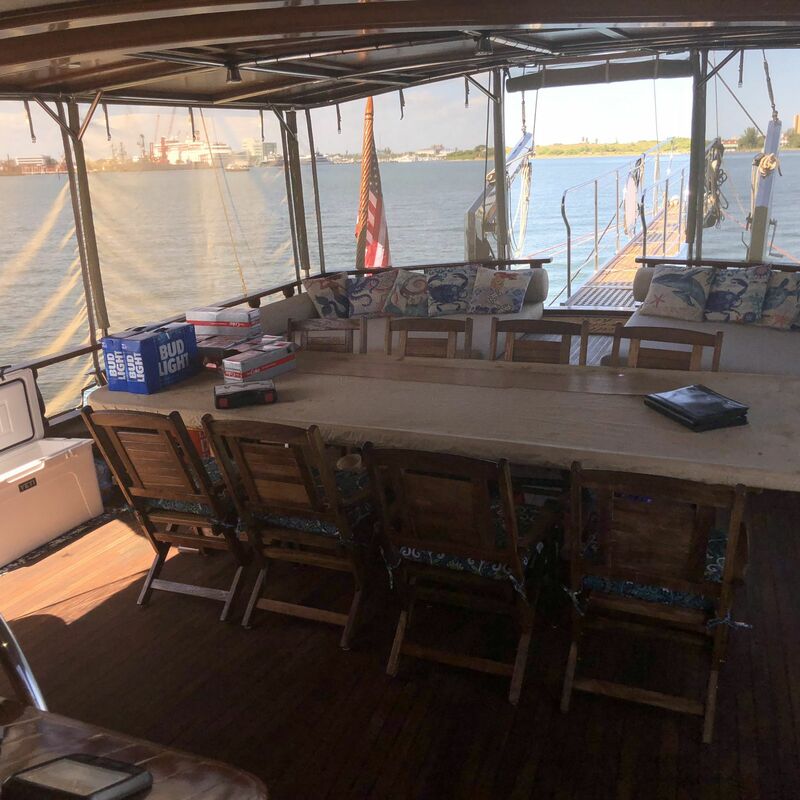 She boasts massive deck space and two separate outdoor alfresco dining areas with two walk up bars, one in the saloon, and one on the stern deck area. 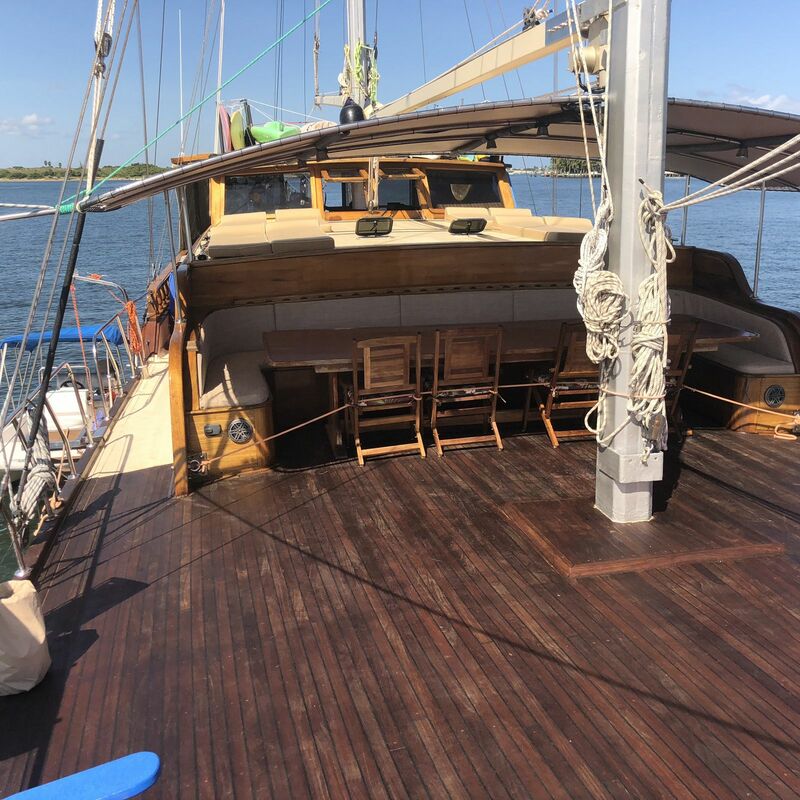 She is equipped with stand up paddle boards, kayaks, surfboard and snorkel gear, and your own inflatable dinghy with outboard motor for island hopping and excursions. I would like to welcome you to experience one of the finest luxury yachts that Abaco Bahamas has to offer! 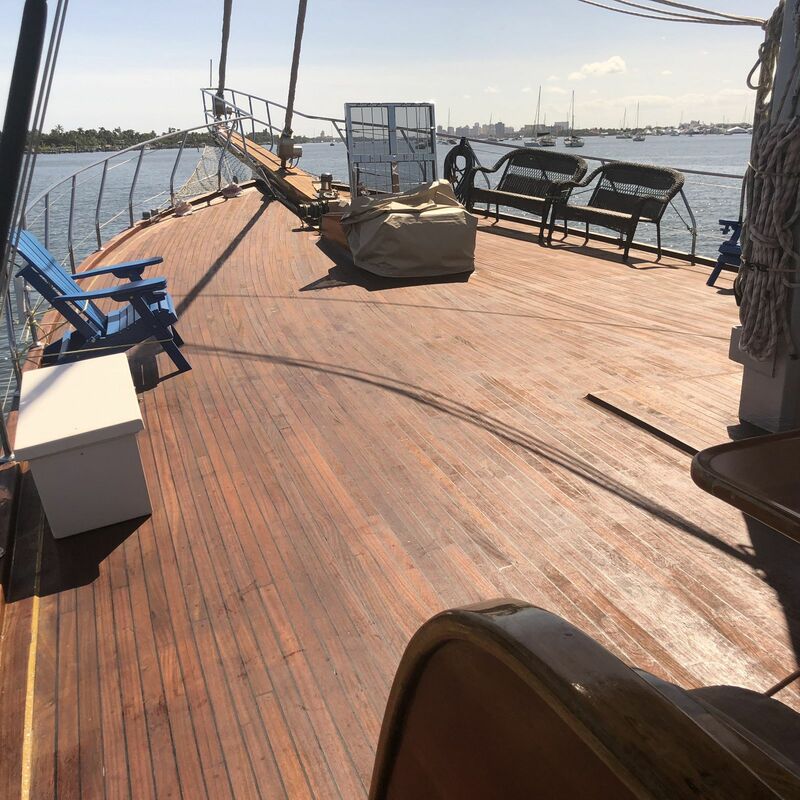 The “Barcelona Explorer” is a stunning two-masted schooner over 100′ in length, built by world class craftsmen, experts in the fine art of turning rich mahogany and teak into a “tree of life”. 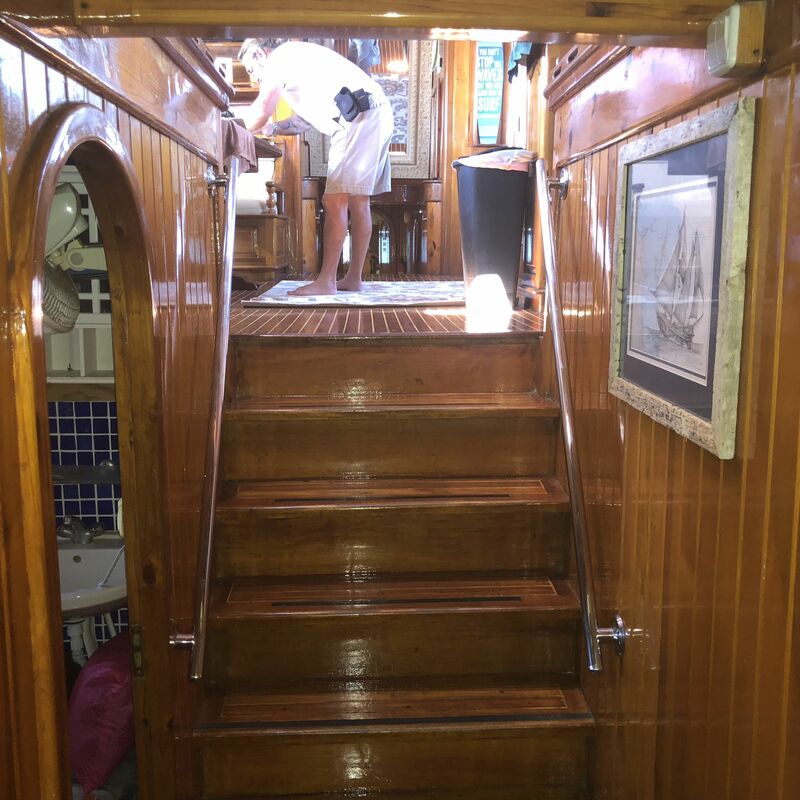 The Barcelona Explorer has a solid mahogany hull, rich mahogany hull sides, with gorgeous and spacious teak decks. 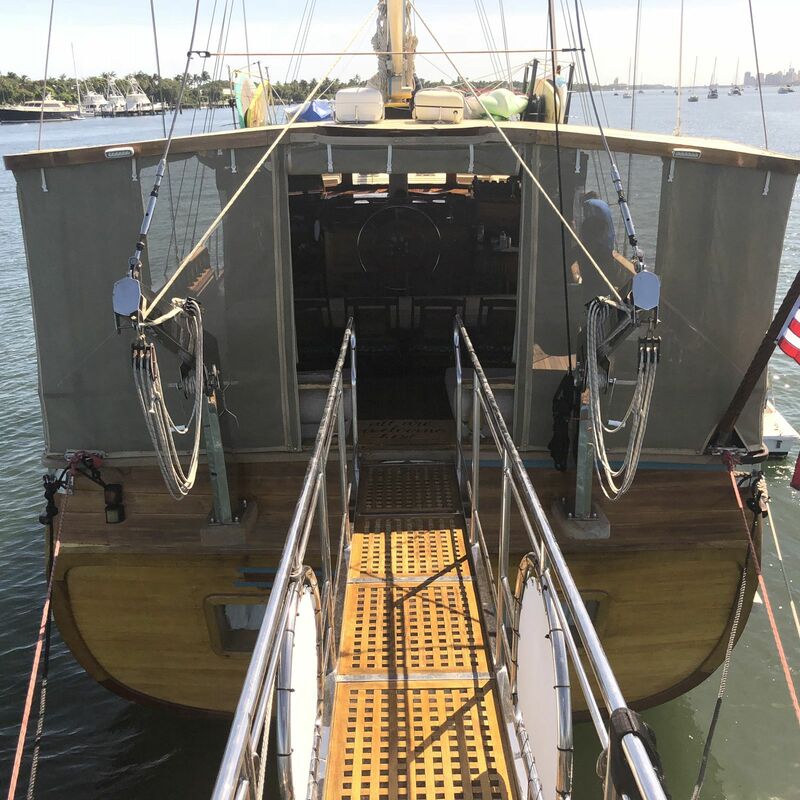 She went through a complete refit in 2013 & 2014 at the shipyard replacing the entire Hull with quality 2 1/2" X 2 1/2 solid Mahogany planks built on all New 6" X 6" epoxy laminated Mulberry Frames on 12" centers. 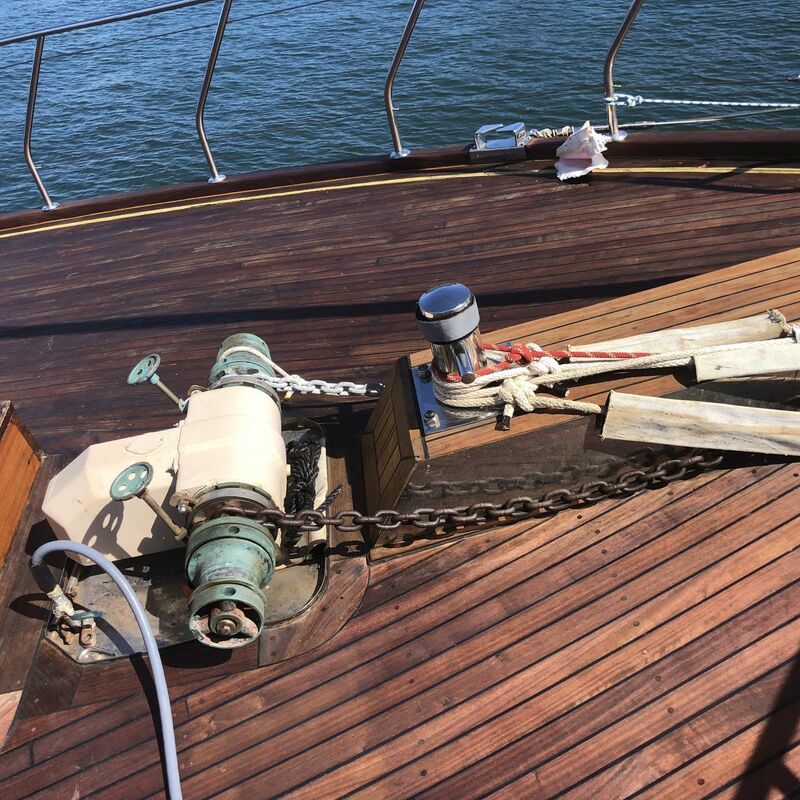 The entire deck was replaced with epoxy based core and thick New teak. She is strong and very well crafted. 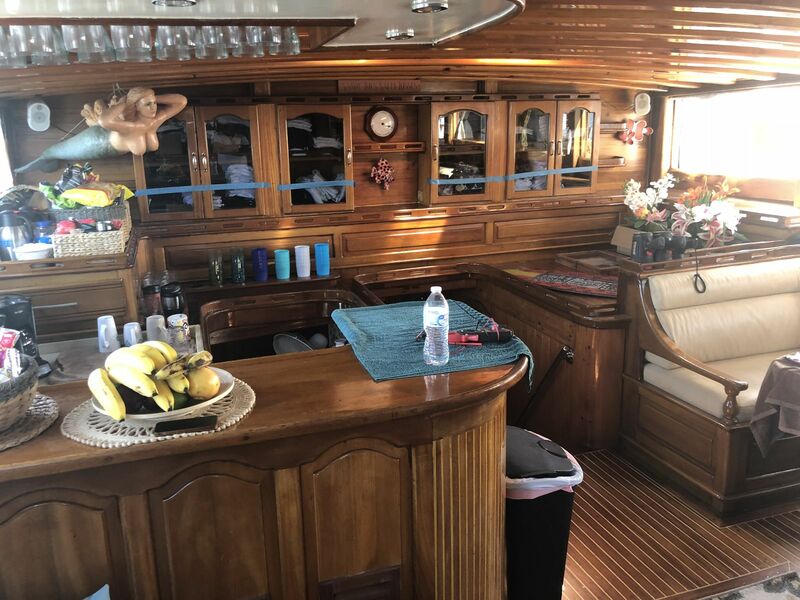 Broker - I am experienced, with over 40 years Buying and Selling Custom Yachts. 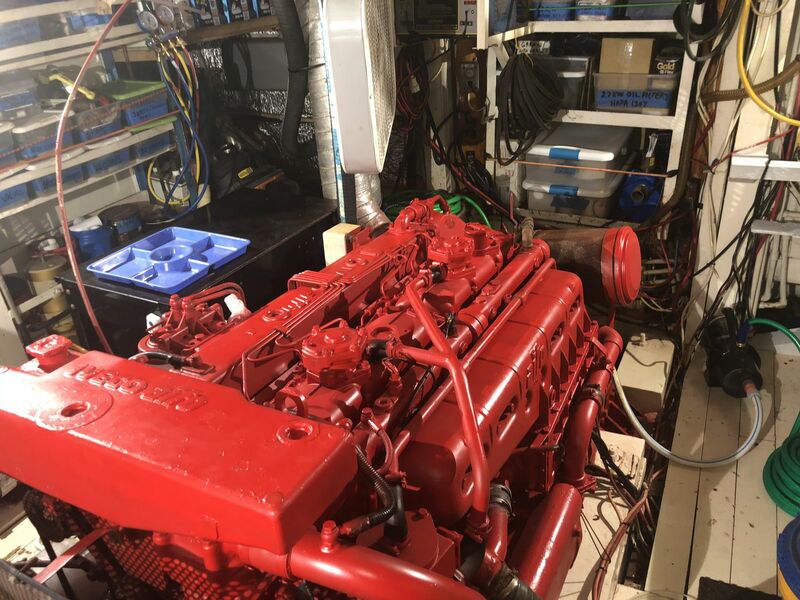 This is a very special Custom Built Yacht and is my pleasure to represent. 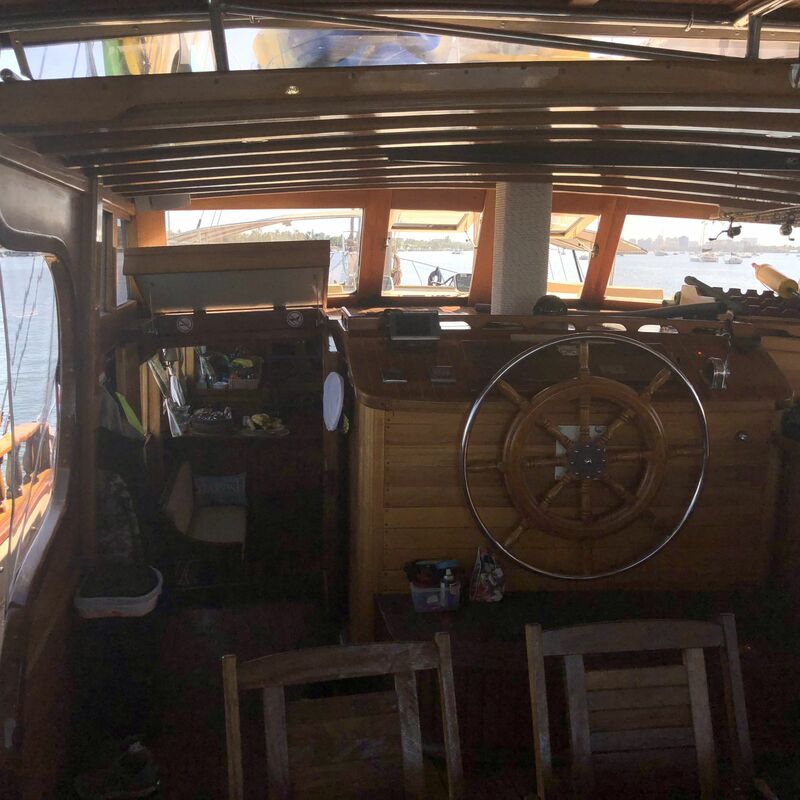 She has the traditional 2 1/2 inch Solid Mahogany Hull clear coated with epoxy, and real Teak decks, in the old fashion design of Class and Strength. 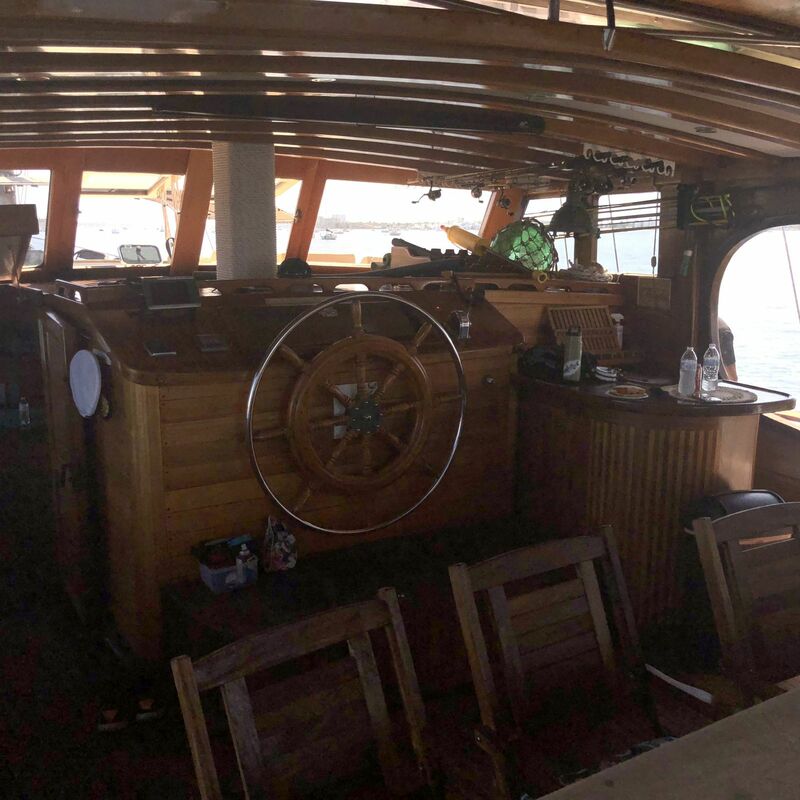 She is very well maintained by her current Owner for many years; who sailed her across the Atlantic from Europe to her home in the Bahamas. She is a very Loved Charter Yacht with seasons of successful Bahamas Charters in her History. She is currently booked for the 2018 - 19 season and ready to go at any time. 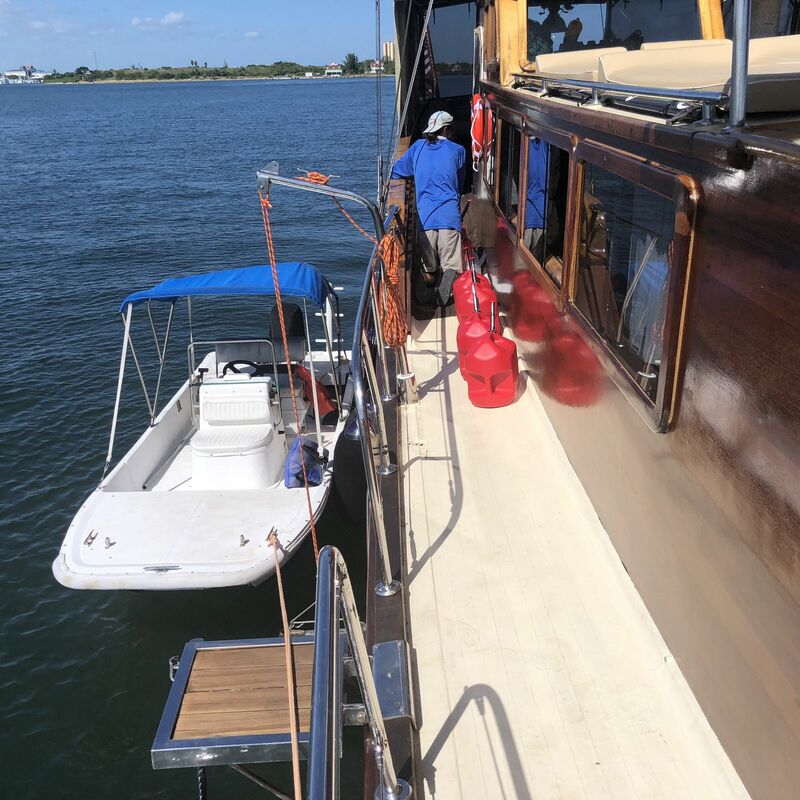 Many of her Charter Guests are returning, yearly, happy customers. The complete LLC. 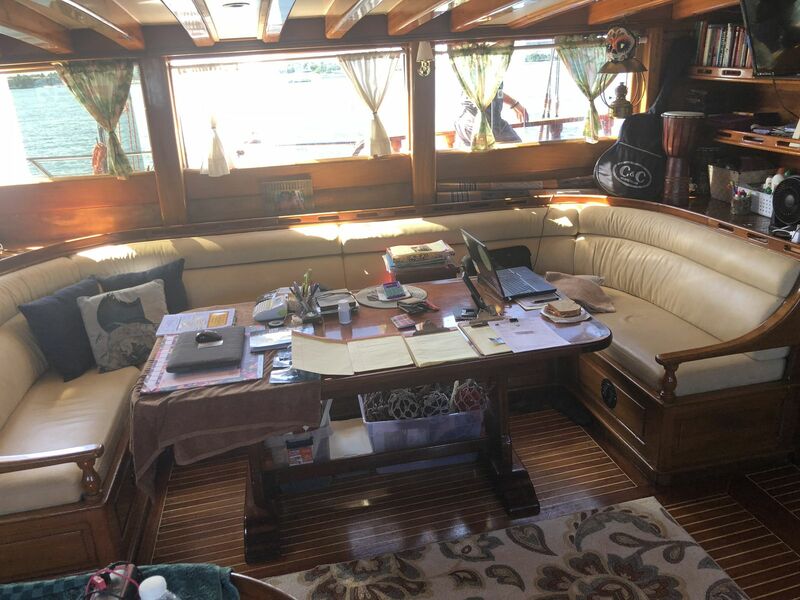 Charter business is included with the Sale of the boat, and will provide a good cash flow and Tax advantage to the right Buyer (currently has $ 250,000 in set Charter Bookings). 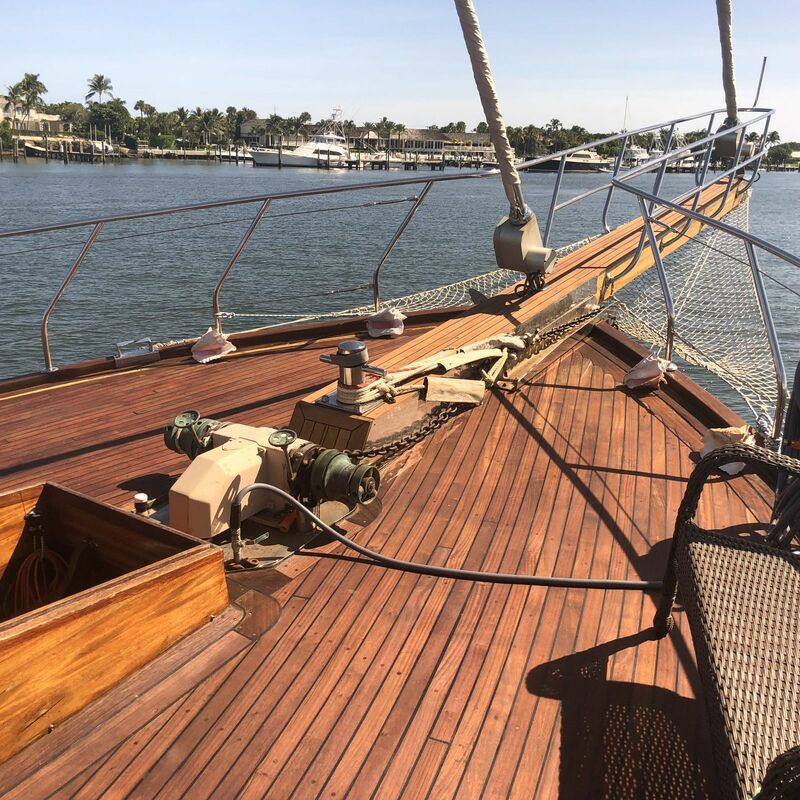 I VERY STRONGLY RECOMMEND CONTACTING ME, TO SET AN APPOINTMENT, TO SEE THIS BEAUTIFUL CLASSIC YACHT - SHE IS THE ONLY YACHT OF THIS TYPE IN THIS PART OF THE WORLD, AND VERY WELL WORTH YOUR INSPECTION. 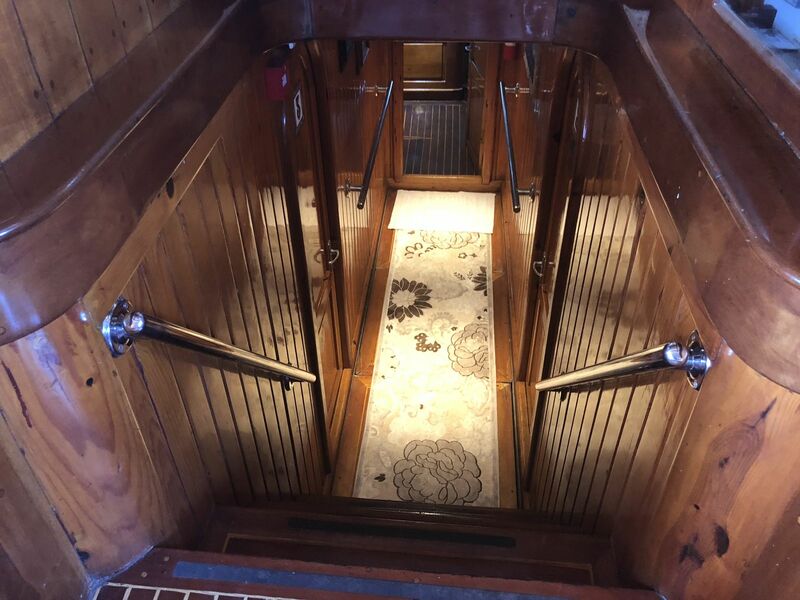 The Stern of the boat has an extended gangway ramp that is long and makes boarding from the land or a tender simple and adjustable. 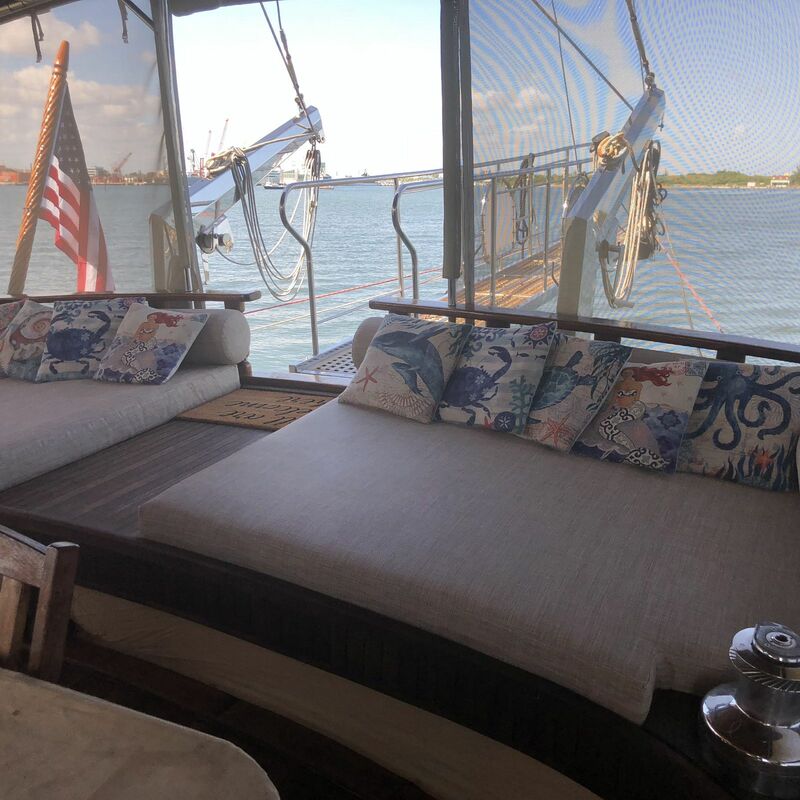 There are large lounge pads on the aft end of the stern deck Port and Starboard. 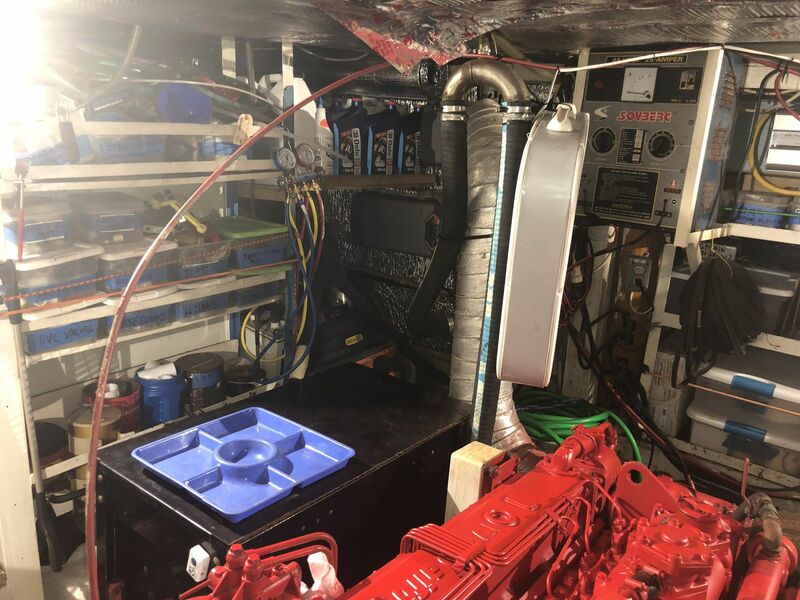 This entire area is covered and screened from the stern forward to the windshield in front of the center-line Helm station. 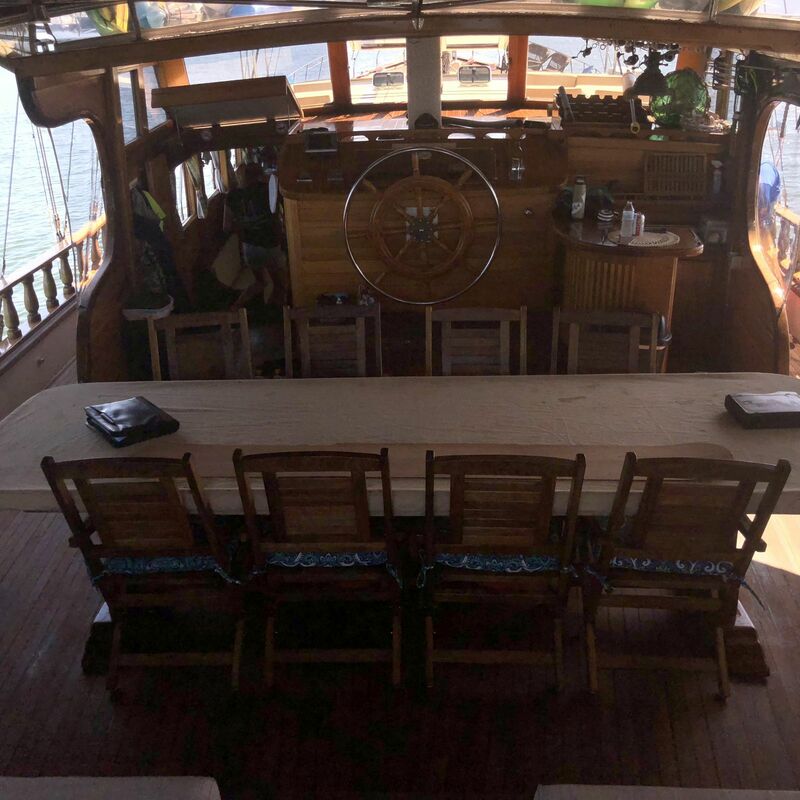 There is a dining table to seat all guests for meals, and an outside bar to Starboard of the Helm. This is a very comfortable outside area that is protected and yet open. 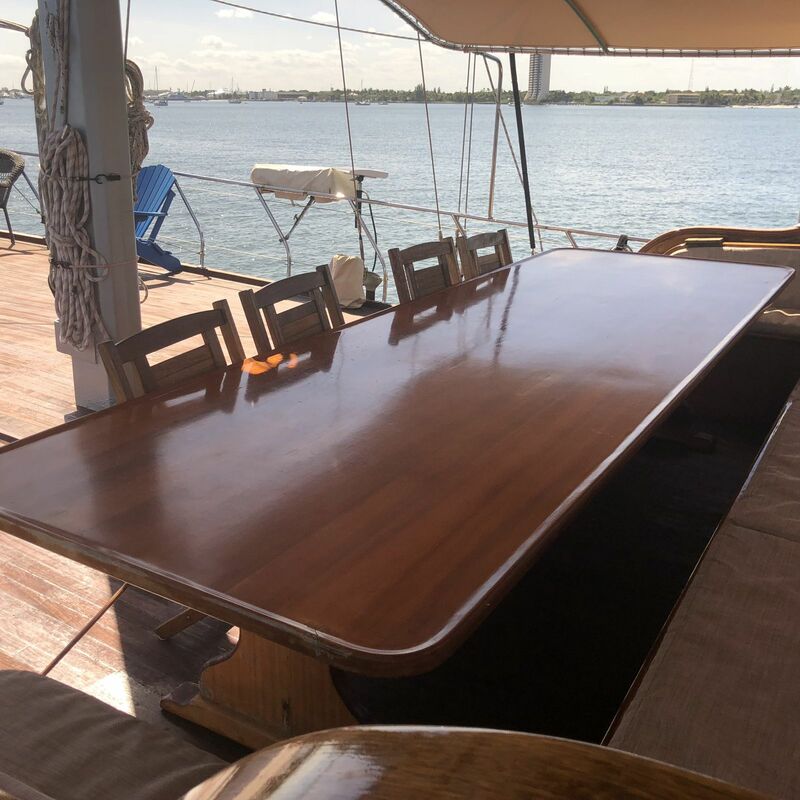 The forward deck space outdoors gives you an incredible view of the crystal clear waters surrounding the yacht. As you meander the decks you can choose from the stand up paddle boards, kayaks, surf board, luxurious sunning mats, or make your selection from the box of quality snorkel gear, and jump right in the water. Two large alfresco dining areas to choose from, you won’t be disappointed with the view, or the savory flavor of the day’s catch. Luxury yacht charters are the way to go! 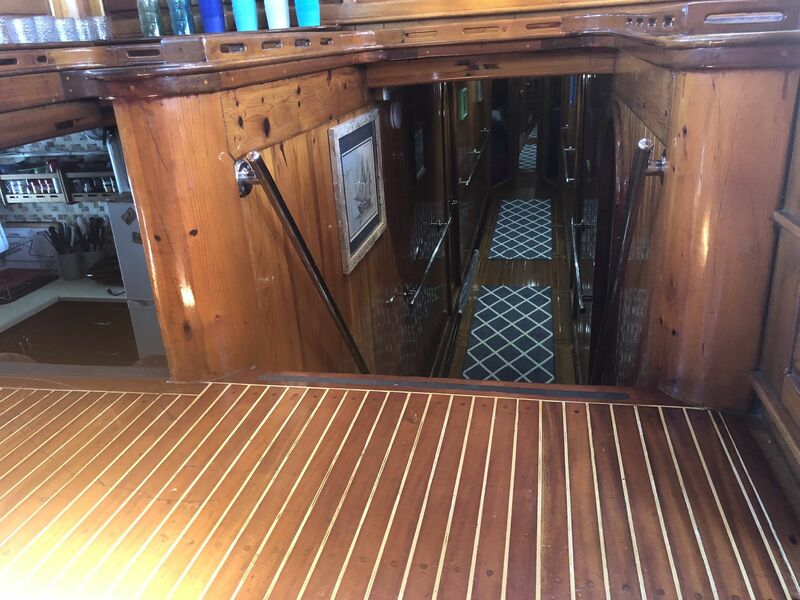 To the Port side of the aft deck Helm is the staircase into the full beam Main Salon. This is a masterpiece of solid Mahogany, carefully built by craftsmen. 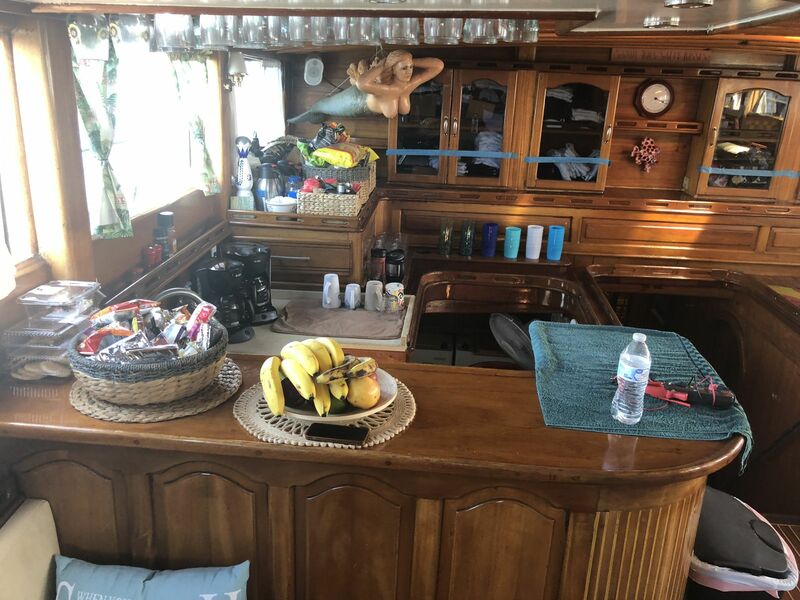 You are surrounded by windows on all sides with a fully equipped Bar on the port side and dining table on the Starboard side. There is a large flat screen TV with theater sound and a collection of over 300 movies to view. 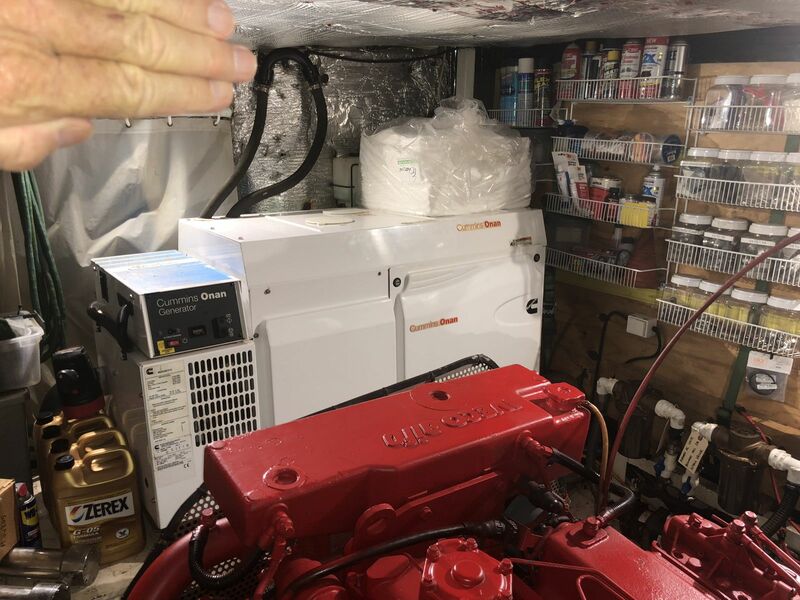 (There is also a 6 foot TV Projection screen out on the Afterdeck). There are many decorative cabinets and the lighting is exquisite for the evenings moods. 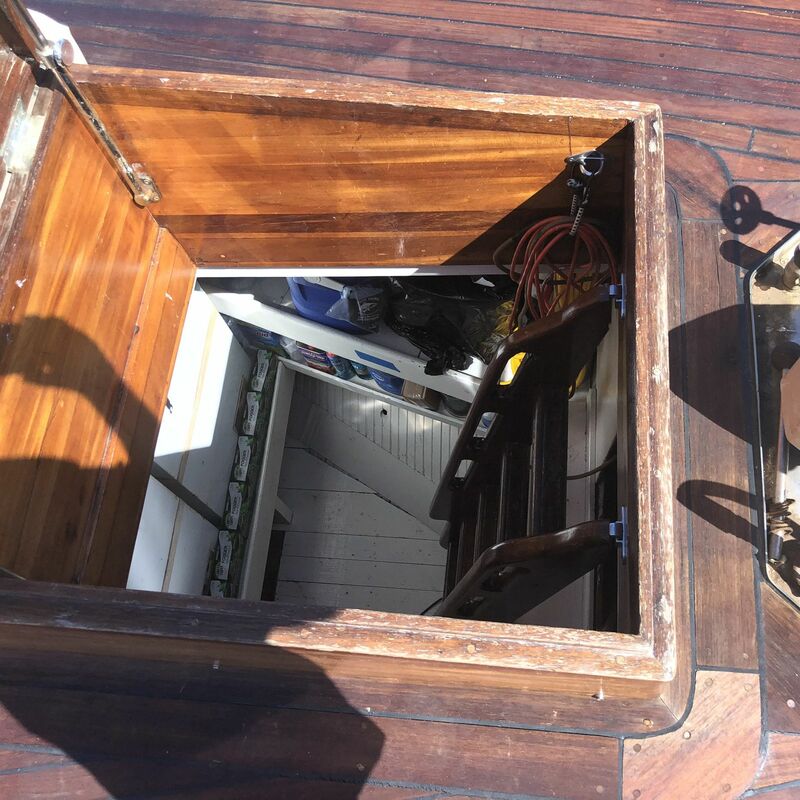 A few steps down on the forward Port side is the Galley. 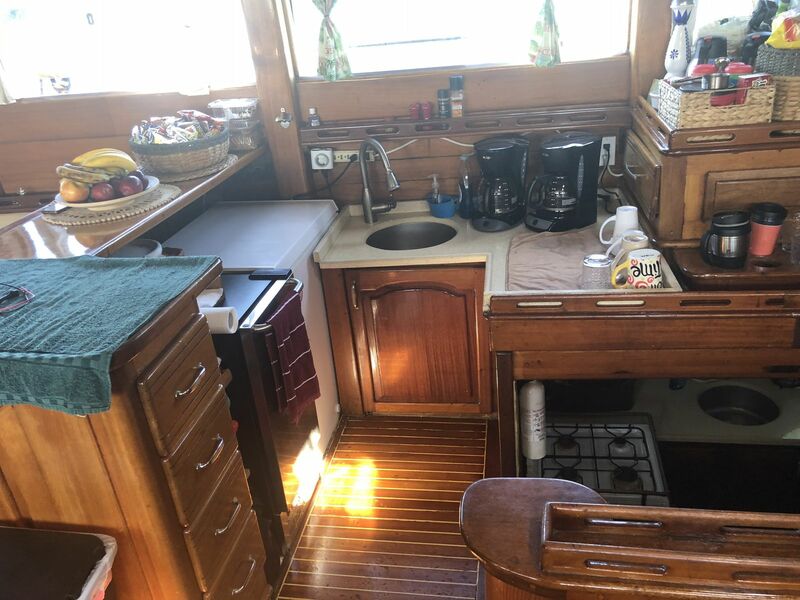 It is a cooks delight with 2 stand-up refrigerator freezers, a full size stove and all the cooking equipment you would expect for a fine chef. 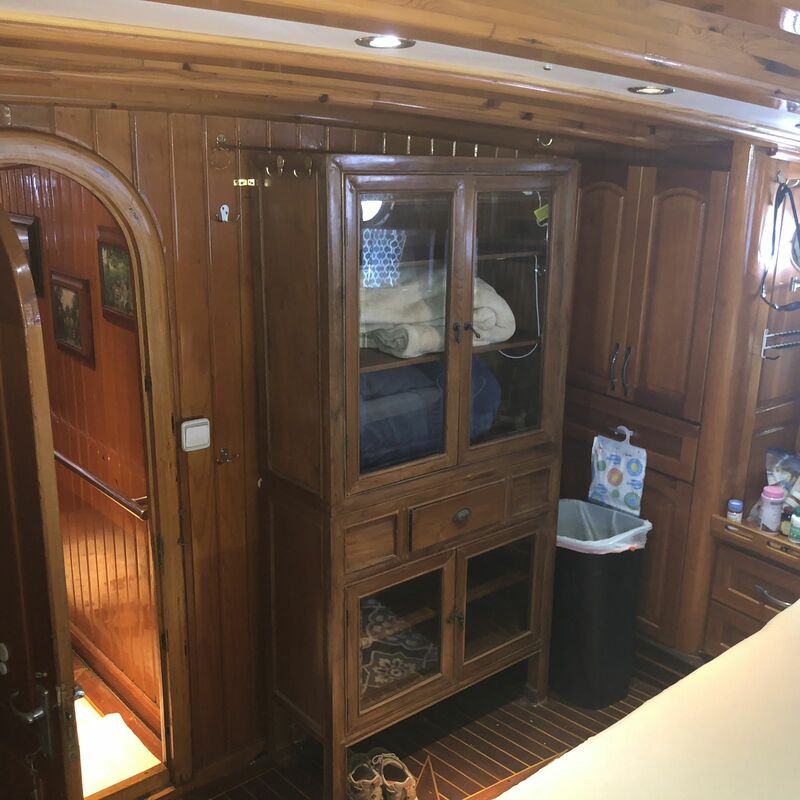 Her interior is truly breathtaking, with teak flooring, stainless gourmet galley, and fine leather upholstery. 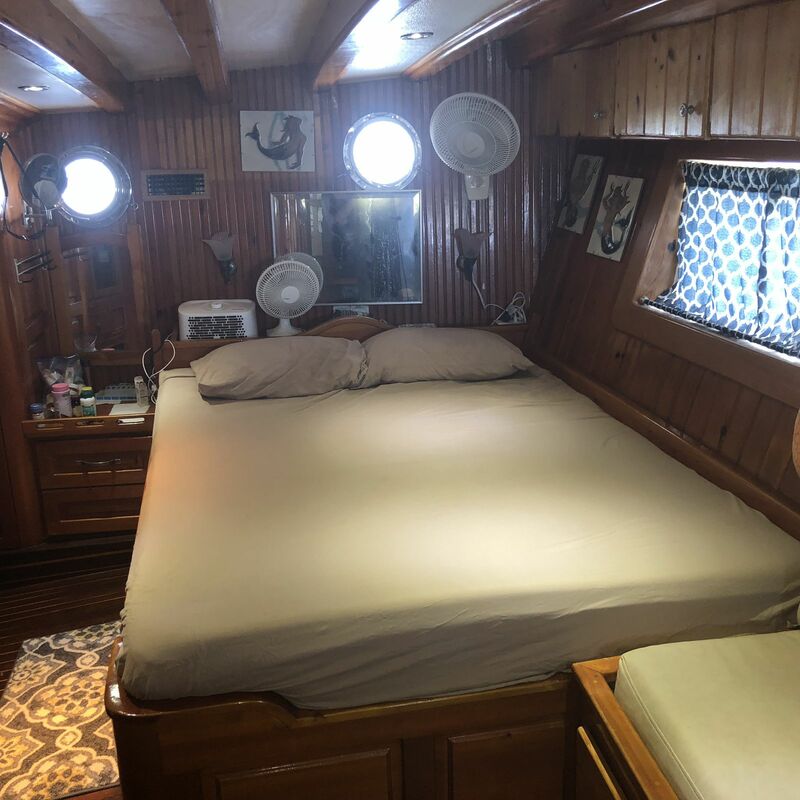 The 6 Staterooms are spacious with generous storage and queen size beds with quality sheets and bedding, full hanging lockers, drawers, ample lighting, and air conditioned. 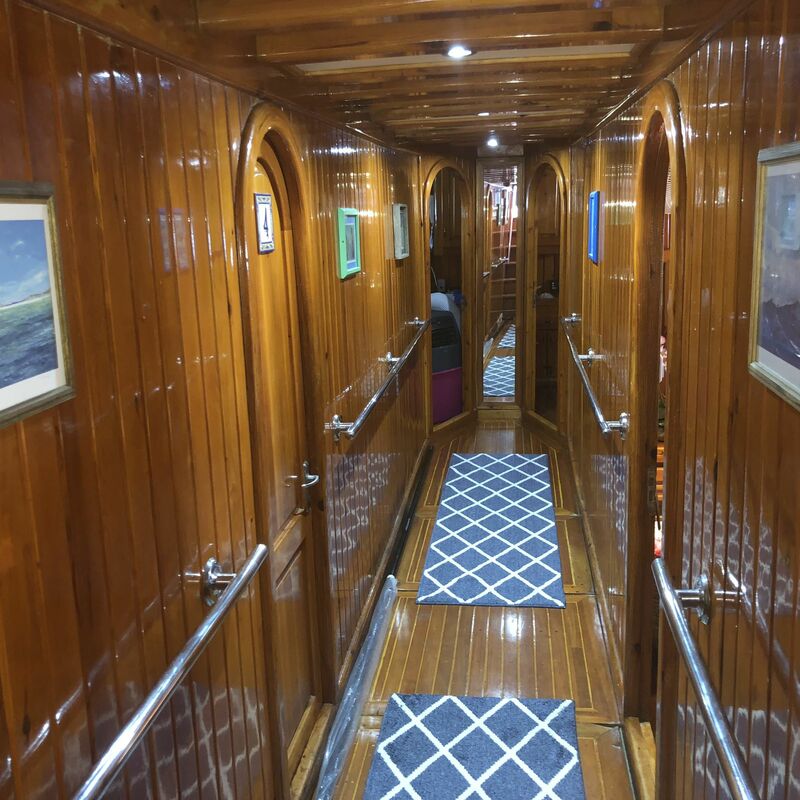 Each stateroom is equipped with it’s own walk in glass shower, full vanity and Standard Home size toilet.